Talakitok or Cavalla Fish (refer to wikipedia), as a simple Juan I find it a bit pricy than Tilapia that I usually use in cooking. 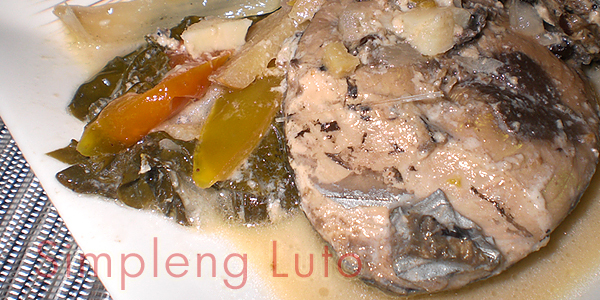 A ginataang Isda or Fish cooked in coconut milk a one delicious food for a simple filipino family. Cooking is so simple yet so yummy that even kids will love. Correct me if I am wrong, this cooking method is known and popularized by the Bicolanos, And yey! am a proud Bicolano boy. There are many ways how to prepare this simple recipe defending on the taste buds of the cook, he or she can also adjust the taste, Either tilapia or any other kind of fish this is how I simply cook this. Put cleaned talakitok fish to a pot. Put 1/2 part of the onion, 1/2 part garlic, ginger, msg, ground black pepper together with the vinegar. When almost soup is dry make the fire turn to low. In a bowl pour coconut milk and add all the remaining ingredients mixing all and stir well. Now, pour over mixed ingredients in the coconut milk to the pot where fished is cook. Add pechay or spinach and adjust fire to medium. Wait until soup thicken and it will be ready for serving.